Branch Brook Park, the nation's first county park, is located in the North Ward of Newark, between the neighborhoods of Forest Hill and Roseville. A portion of the park is also located within the Township of Belleville. The park is noted for the largest collection of cherry blossom trees in the United States. The Newark Light Rail runs on the park's west side providing multiple access points to the park from Downtown Newark. 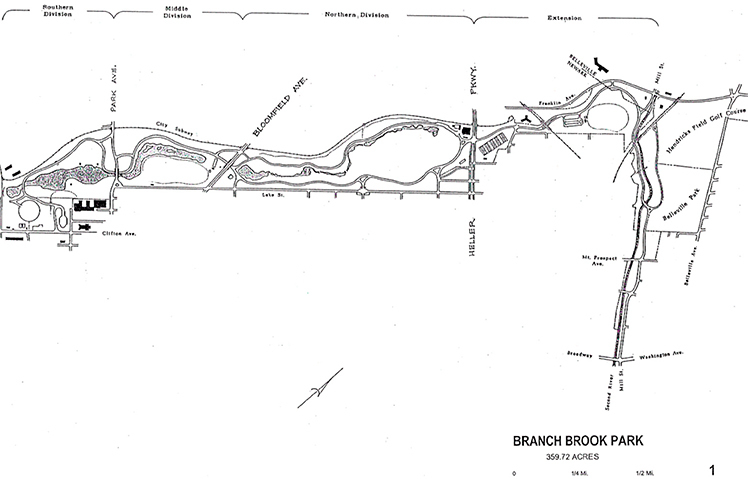 Branch Brook Park is listed on both the New Jersey (1980) and National (1981) Registers of Historic Places. There is a gravel walking / jogging path throughout the park. When we visited in 2013, we noticed that some of the packed rock had been washed away, creating some uneven ground. Though it was not a large problem or dangerous at all, we would recommend being extra careful when using the trail. We visited the park back in 2013, around the time of the annual Cherry Blossom Festival. We got there later in April, and found that most the blooms were gone already. But this year, in 2018, it sounds like the CB bloom will be in mid to mid-April! Spectacular view of the Cathedral Basilica across the lake. Annual Festival and 10-k run at cherry blossom time. The famed "Cherry Blossom Land." Listed on both the state and national historic registers. Completed in 1995, site of the park system's Centennial Birthday Celebration. A large lake, meandering streams, and in the north, the Second River channel. Playgrounds, ballfields, basketball, tennis, horseshoes. Greenhouse acts as a central nursery and horticulture center for the entire park system. The northern division meadow is one of the largest recreational open green spaces to be found in Essex. "Monarch Meadow," a newly established butterfly garden. Senior citizen center, originally a boat landing shelter. Walled remains of the old Newark reservoir. Near the reservoir a mound and its retaining stone wall are designed to resemble an ancient ruin. Pedestrian bridges, Park & Bloomfield Avenue bridges and the railroad bridges in northern extension are striking architectural features. Sculptured lions which flank a formal boat landing were originally stationed in front of the old Newark Prudential building. One thing to note here was that there is specific a entrance to get into the park. It is very a large, running preliminary north to south, with many entrances off the side / surrounding roads. Our map shows many many entrance points. But for your GPS, you may want to use the following to just get you to the park: The only real entrance we can quote is: 192 Park Ave. Newark, NJ 07104 (40.758100, -74.183080) In this area you will find an entrance to the main park drive, and a way to get onto the main road in the park. Get Directions Park Ave. & Lake St. Pick one or join us for many of our fabulous featured events during the 2018 Essex County Cherry Blossom Festival!